Mazus Reptans 'Albus' is a fast growing groundcover plant and perennial plant that can be grown in USDA Plant Hardiness Zones 5A through 8B. It matures to an average height of 1 inch to 1 foot and an average width of 1 foot to 2 feet, depending on climate and other environmental factors. It prefers growing in a location that provides full sun, morning sun with afternoon shade, morning shade with afternoon sun or filtered sun and grows best when planted in loam, clay or silt soil that is well drained, moderately drained or moderately wet. 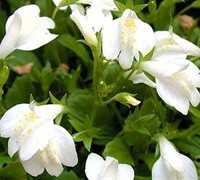 In the spring and summer White Mazus produces white flowers. The foliage is medium green and dark green in color. White Mazus can be useful in the landscape along woodland borders, in mass plantings, in containers or planters, as a border or edger, as a groundcover, between stepping stones and pavers or in landscape beds or islands and also in theme gardens, cottage gardens, bog gardens, perennial gardens or shade gardens. 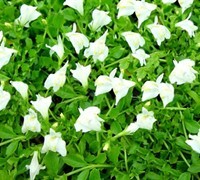 Mazus reptans 'Albus' is a white flowering form that like its cousin is a mat-forming perennial groundcover that grows to 2 inches in height with rosettes of lance-shaped, toothed, bright green leaves that creep and spread hugging the ground as it grows. The foliage is evergreen in warmer climates. From late spring to mid-summer the snapdragon-like white flowers with lower lips spotted with yellow nearly cover the foliage. Mazus is a very vigorous groundcover that fills in quickly without being aggressive. It is perfect for use between stepping stones or to cover large patches of soil. It looks especially nice around boulders and the garden pond in our trial gardens. It can also be used as a very low-maintenance lawn substitute. It is easy to grow in moderately fertile, moist but well-drained soil and prefers shade or morning sun with afternoon shade. This versatile plant will take more than it's share of abuse and keep on growing!